Prayers For Boston Bombing Survivor, Dancer, and Inspirational Speaker Adrianne Haslet!! Boston Bombing Survivor, Dancer, and Inspirational Speaker, Adrianne Haslet, is in the hospital after being hit by a car this past weekend. 🙁 According to her instagram (seen below), she was thrown into the air and then landed. The accident crushed the left side of her body leaving her “completely broken” and she’s going to need a lot of surgery. If you are new to the site, Adrianne is a friend to us and fan of Dancing With The Stars. Please be thinking of her and send her lots of strength, love, and prayers. Adianne, we love you and we’ll be praying. Hang in there, Girl!!!! Love from all of us at PureDWTS! Struck by a car on Commonwealth Avenue, while on a crosswalk. Thrown into the air and landed, crushing the left side of my body. Yesterday. I’m completely broken. More surgery to come. From Everyone At PureDWTS: Congratulations Adrianne Haslet-Davis!!! 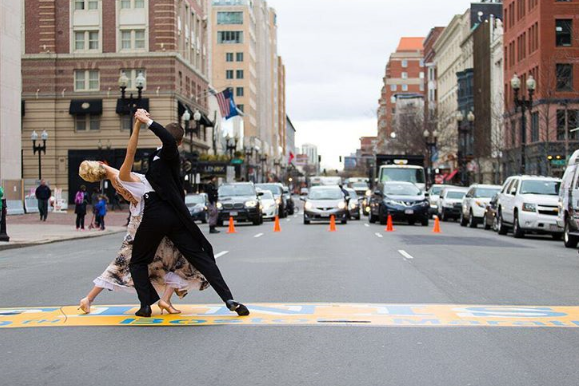 Give it up for Boston bombing survivor and Ballroom dancer Adrianne Haslet-Davis! Tonight she “re-defined the finish line” (again!!) at the 2016 Boston Marathon. As you know, recently we interviewed Adrianne. She talked on her recent appearance on Dancing With The Stars and training for the Boston Marathon. Well, we couldn’t be more proud of her and all of the participants who ran today in the Boston Marathon!! WOO HOO!!! CONGRATULATIONS ADRIANNE!!! YOU GO GIRL! YOU DID IT! Vogue: Hi Adrianne! What an honor it is to be able talk with you. I’ve been a long time fan and have been watching your progress since the Boston Bombings! What an angel you are who has come full circle. You have become a huge inspiration and beacon of light for others through this awful tragedy. Through it all, you’ve turned it inside out and not let it or the terrorists beat you. How have you been able to overcome everything and maintain such a beautiful outlook, love, and passion for people? Not only that, you haven’t let anything stop you from dancing or running. The biggest motivation keeping me going is knowing how far I have come, yet also how real the struggle was to get here. I never want to portray that I have overcome everything, because I feel like my recovery is an ongoing forever process. We all evolve and change, and my love and passion for people is a direct connection with that. I am motivated by the struggle to keep going even when we feel like pulling our head under the covers. Life is tough but that is what makes it Read more..
Several interviews with Boston Bombing survivor and Ballroom Dancer Adrianne Haslet Davis! First, she talked with Maria Menounos on SiriusXM Entertainment about her visit to Dancing With The Stars Monday night and what it was like. She also talked a little on Derek and dancing with him during the Move Live On Tour. More below or at the link. Also, below is an interview with Kristyn Burtt too. Stay tuned. We have an exclusive interview with Adrianne coming up later today! Just a little heads up! Tonight Adrianne Haslet-Davis will be sitting in the audience tonight at Dancing With The Stars. She may be also interviewed on “DWTS All Access” tonight. So, be sure to tune in!! Private Members Area – Do You Have Questions For Adrianne Haslet-Davis For A New Interview? Hi Everyone! Remember when Dancing With The Stars did a special feature on Adrianne Haslet-Davis after she lost part of her leg and foot in the Boston Bombing?? At the time she was still dealing with the reality of losing part of her leg and yet, even then, she talked about wanting to dance again. In fact, Dancing With The Stars was going to follow up on her the next season, but, they haven’t yet. Well, Adrianne is dancing again (videos below). Not only that, she’s running again too. In fact, on April 18th, Adrianne is running in the 2016 Boston Marathon. Like Amy Purdy, she’s come full circle. In honor of Adrianne and her inspiring and moving comeback, do you have questions for her? 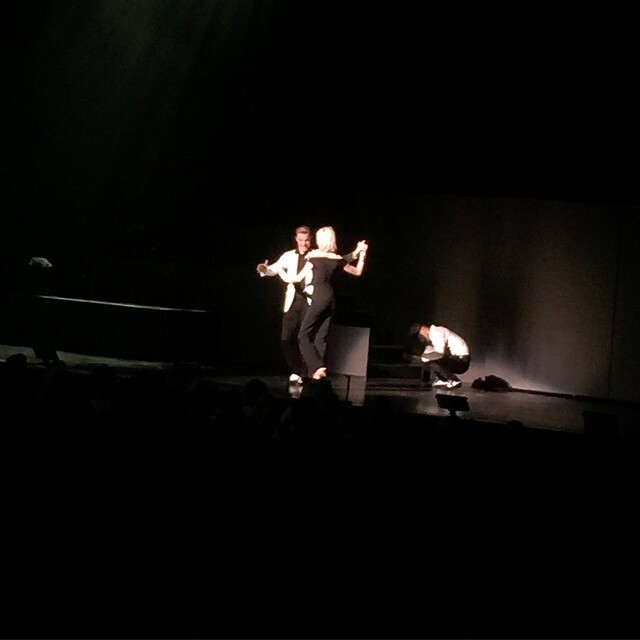 If so, let us know in comments and then Read more..
Last night during the Move Live On Tour, Derek Hough danced with Boston Marathon survivor Adrianne Haslet-Davis. Like Amy Purdy, what a huge inspiration she is. She’s come a long long way to get to this place in her life. What a beautiful, unforgettable, heaven-made moment. Thanks to Mishti for the video below. Pic above courtesy of Laura Morris. For lots more on the night including comments from Adrianne, fan reviews, photos, and videos, see Pure Derek Hough. Dancing With The Stars Derek Hough is pictured in the new August issue of W Magazine in their “Ones to Watch” feature. If you go to this link, you can see a new photo of him wearing a Dsquared2 shirt and pants. He also talks of doing reality TV in the beginning. Also, just a heads: Remember dancer Adrianne Haslet-Davis who lost part of her leg in the Boston Bombing? She tweeted last night that she will be having a dance lesson with Derek and Julianne before the “Move Live On Tour” Boston show tonight. Stay tuned to Pure Derek Hough if this happens. In a previous posting a few weeks ago, we reported how Boston bombing survivor Adrianne Haslet-Davis would be dancing for the first time at the 2014 TED Conference in Vancouver, British Columbia this week and that she might be dancing on Dancing With The Stars this season. People has a great report on it which you can watch below. They also mention how she will be dancing on Dancing With The Stars. Remember Adrianne Haslet-Davis the professional dancer and instructor who lost part of her left leg in the Boston Marathon bombing? Well, next week, she will dance for the very first time for a show in Vancouver, Canada. Not only that, at some point this season, it sounds like she will be making an appearance on Dancing With The Stars. You can watch Adrianne talking about it in a video at WCVB. Like Amy Purdy, she is a huge inspiration. I love how she says, “It’s not just me I’m fighting for”. From that, Haslet-Davis said the first ever bionic dance leg that restores the body’s natural movements and patterns was created. She is expected to show how it works at the annual TED Conference, where technology, entertainment and design ideas are shared. Getting to this point hasn’t been easy for her or her husband, Air Force Capt. Adam Davis, who was also injured during the blast. But, she said, this is hopefully the first of many more dances in her life. After all, we’re all waiting for her TV debut.